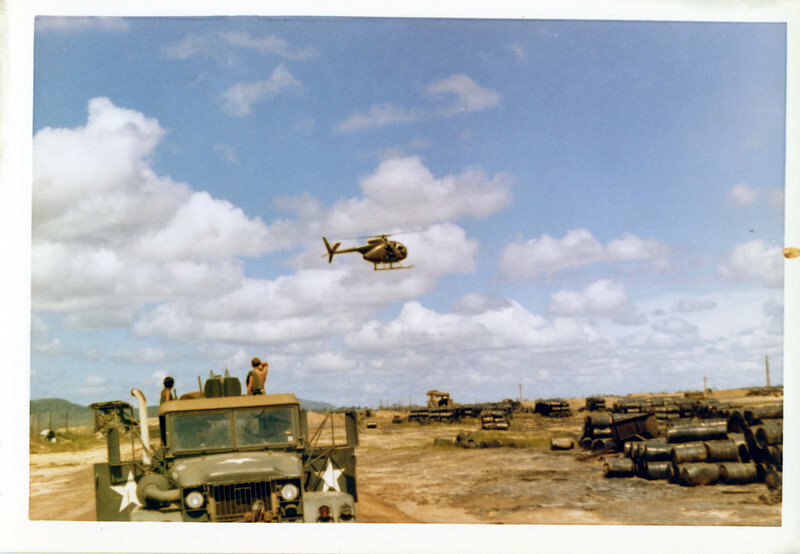 The "Loach" or light observation helicopter (OH-6A "Cayuse") seen just outside the "wire" at Di An Basecamp, the home of the 11th Armored Cavalry Regiment in 1971. © 1971, MJ Roche. 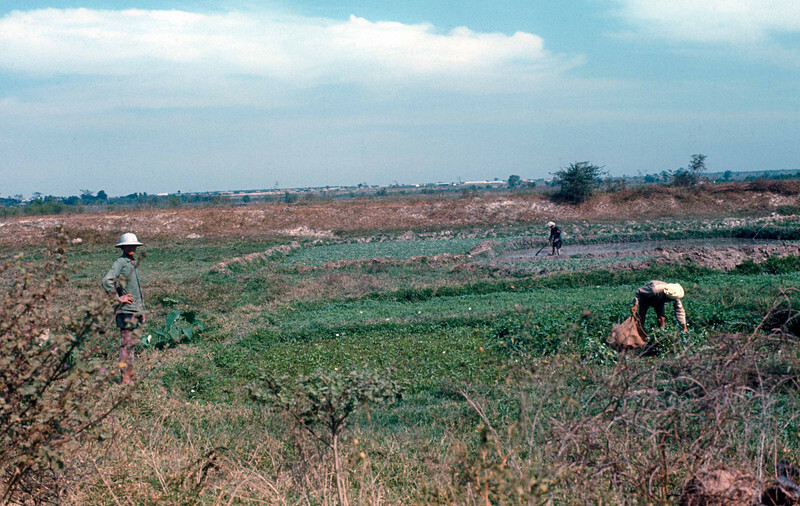 Cultivating crops off Route 1 near Saigon, March, 1971. © 1971, MJ Roche. 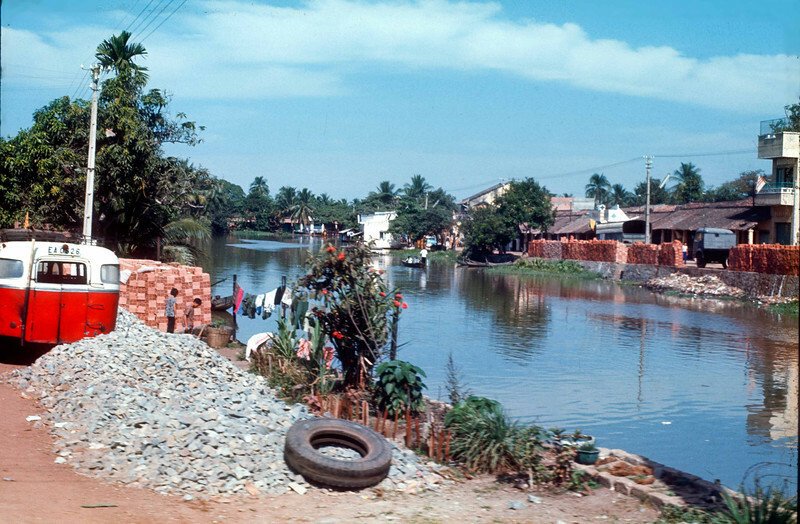 A masonry plant outside of Saigon, 1971. © 1971, MJ Roche. 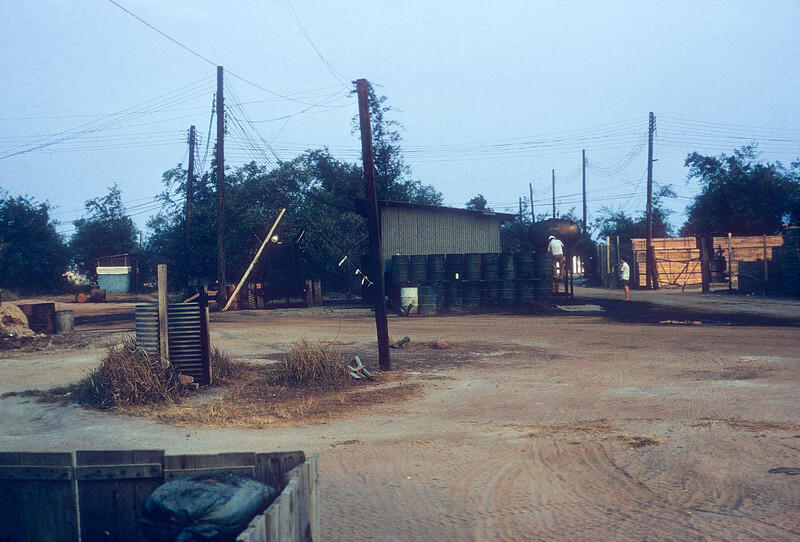 War-impacted housing on Highway 1 near Saigon, March, 1971. © 1971, MJ Roche. 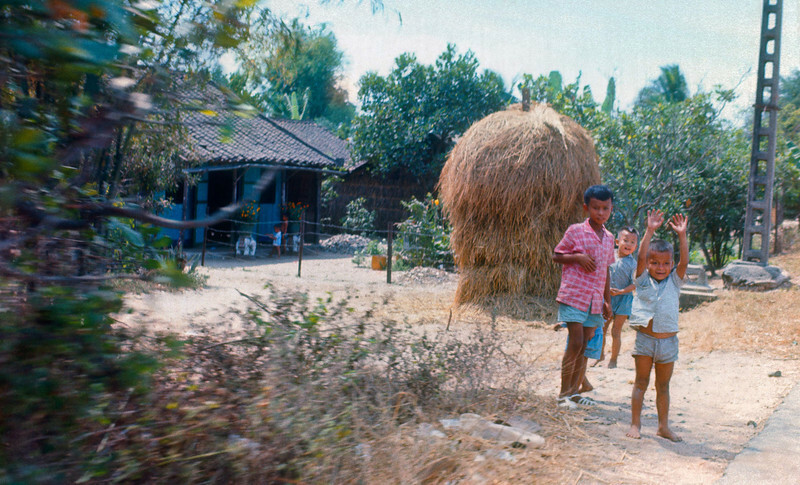 The road to Saigon, Winter, 1971. © 1971, MJ Roche. 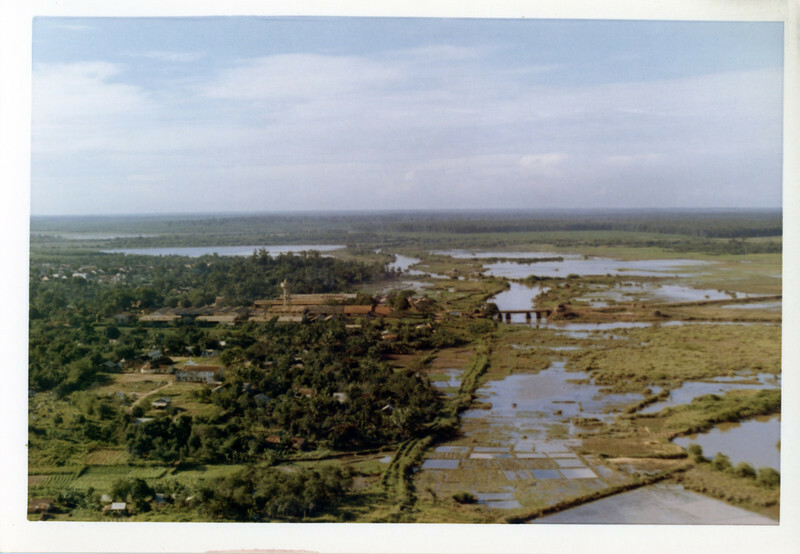 A small village and rice paddies seen from a Huey (Bell UH1) helicopter on a mail delivery flight to Nui Ba Den. © 1971, MJ Roche. 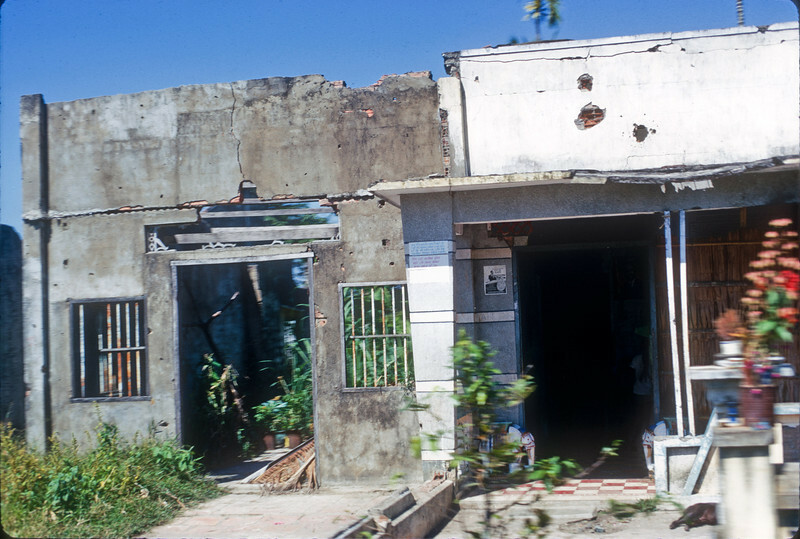 An old French villa off Highway One on the way from Di An to Saigon. © 1971, MJ Roche. 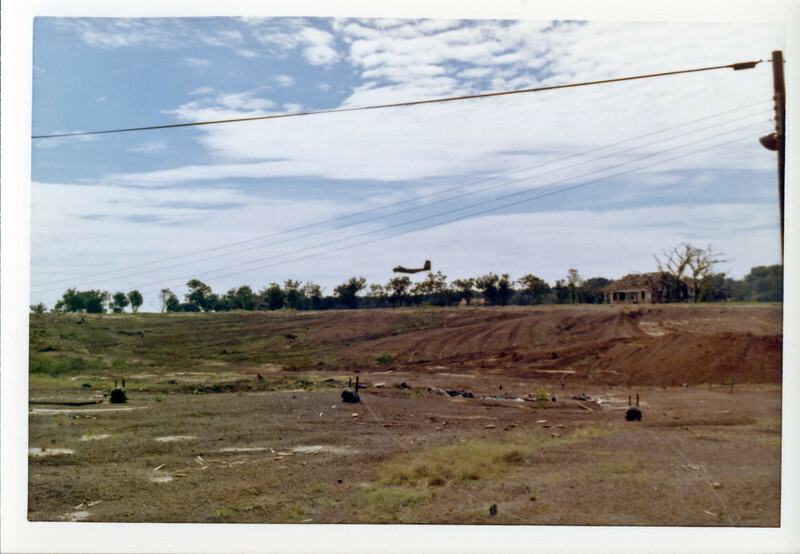 A C-130 cargo plane lands at the US Army airstrip at Bien Hoa. 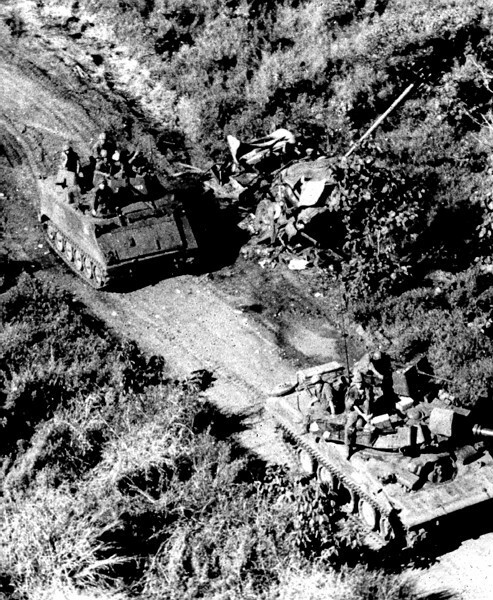 US claymore mines are shown in the foreground. © 1971, MJ Roche. Nui Ba Den (Black Virgin Mountain) in Tay Ninh Province stands over 3200 feet tall. Seen here from a small fire support base (11th Armored Cavalry Regiment). 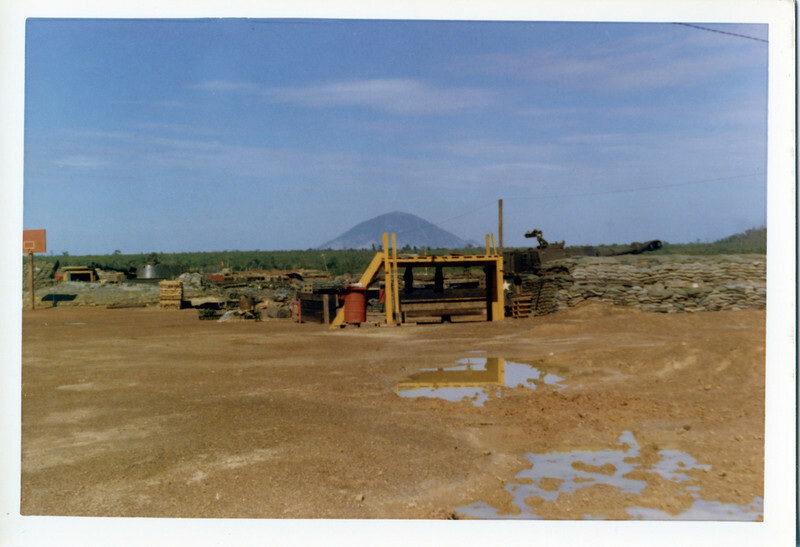 The extinct volcano had a US Communications base near the summit and was sprinkled with VC caves throughout the center elevations. © 1971, MJ Roche. 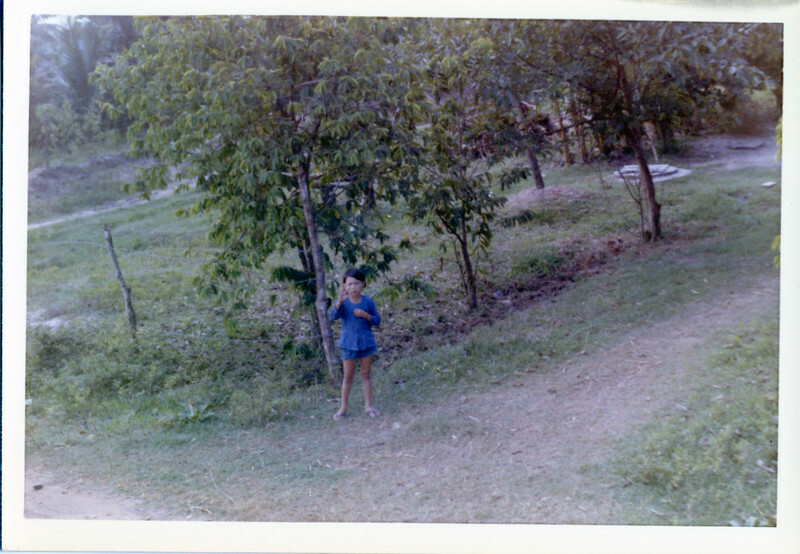 A boy waves to a passing US Army convoy on Highway One near Saigon, January, 1971. © 1971, MJ Roche. A young girl waves at a passing US Army duece-and-a-half truck. © 1971, MJ Roche. A farmer cultivates his crops just off Route 1. © 1971, MJ Roche. Kids wave at a US Army Jeep. © 1971, MJ Roche. 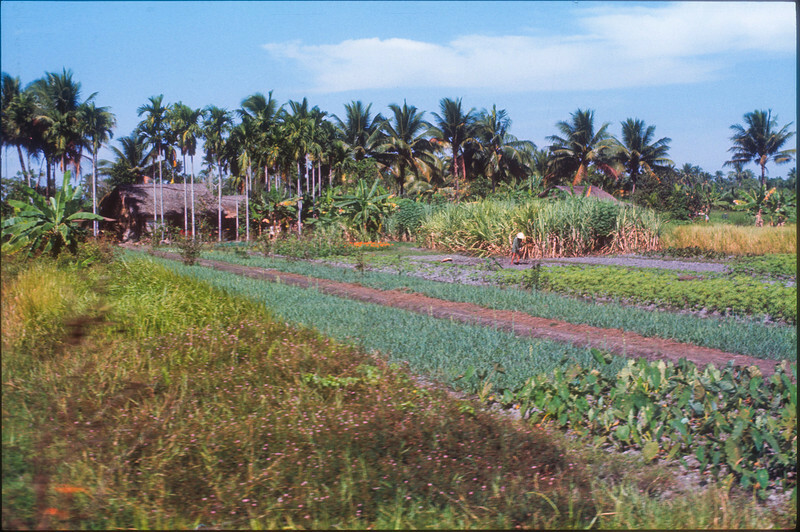 View at Di An, February, 1971. Generating station. right, with piss tube and latrine at center, left. (11th Armored Cavalry Regiment). 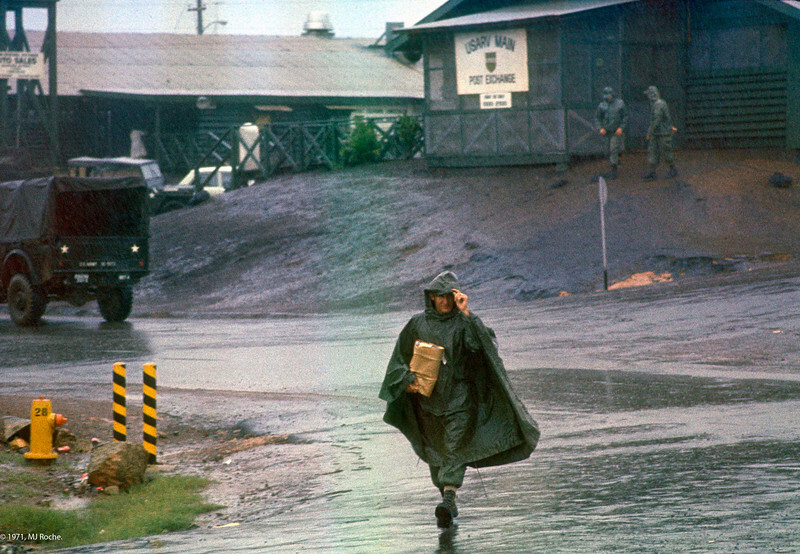 Foreground, left, are the sand bags at the front of the 17th PID (Public Information Detachment) hooch and office building that were designed to minimize casualties during rocket attacks. At right, center, two Vietnamese contractors adjust the fuel tanks feeding the source of local electricity. The noisy generators ran 24 hours a day, but you only realized they were there when they were shut down for maintenance! © 1971, MJ Roche. 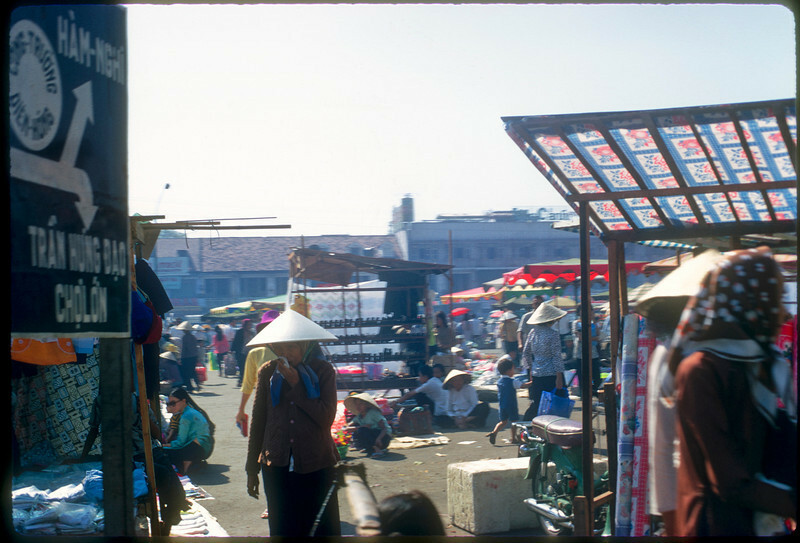 Saigon street market captured in January 1971. Directional sign indicates upcoming intersection. © 1971, MJ Roche. 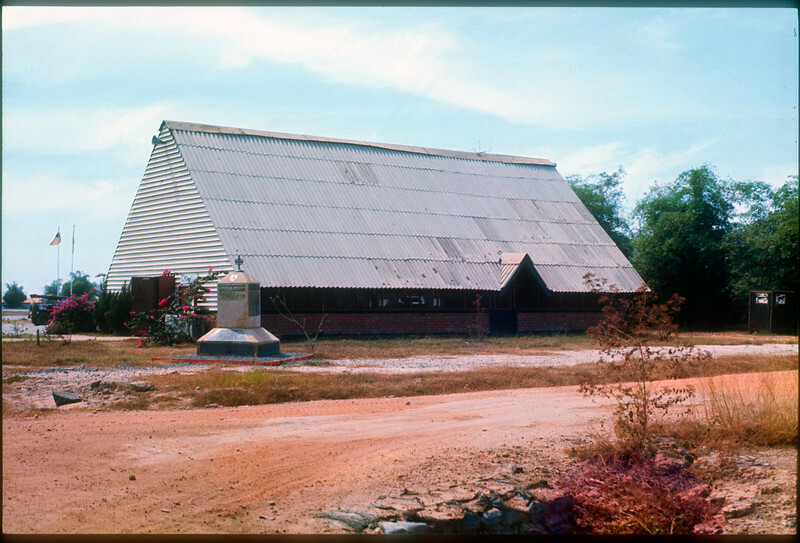 The 11th ACR Chapel at Di An circa February 1971. The marker in front holds brass plates with the names of fallen troopers, many recently added from the incursion into Cambodia in mid 1970. © 1971, MJ Roche. 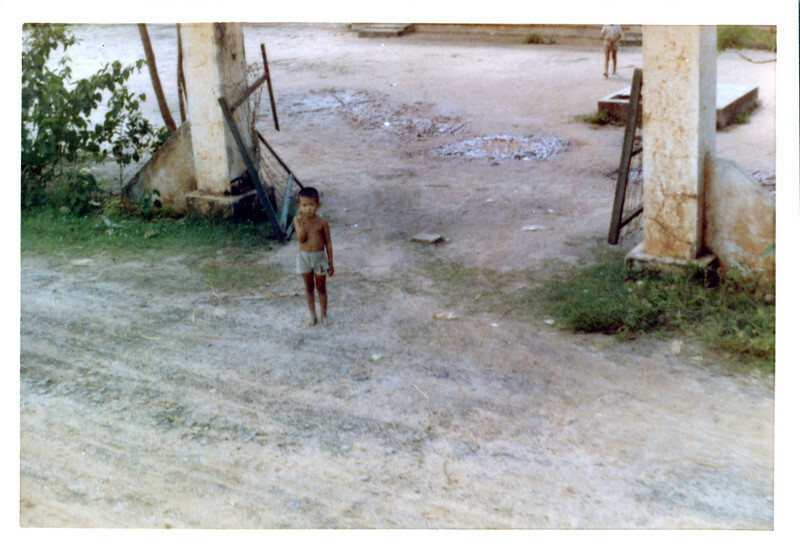 This image was taken out the window of my office at the Engineer Command (Castle Courier Newspaper) at the air conditioned US Army Headquarters, Long Binh. The cars await the senior officers who are about to end their day. 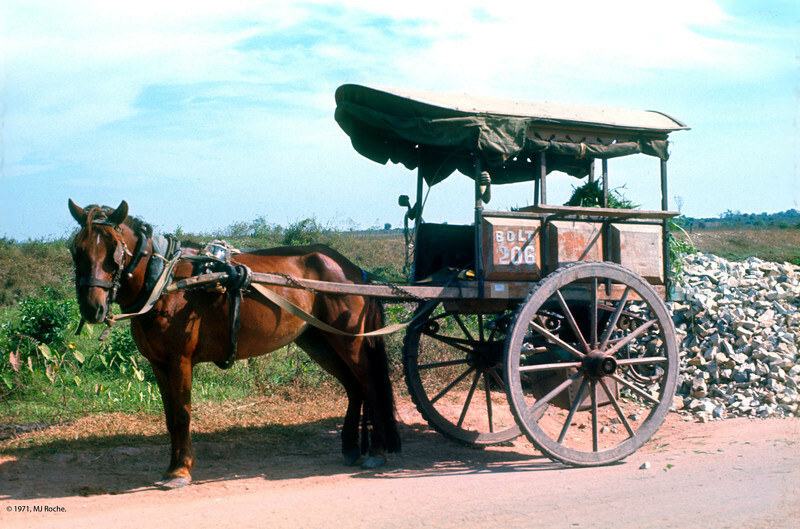 Many had civilian Vietnamese drivers. © 1971, MJ Roche. A DEROS calendar (acronym for "Date of Eligible Return from Overseas" ) hangs over a bunk in Long Binh. This jet airplane was created by Castle Courier Assistant Editor, William Smith. 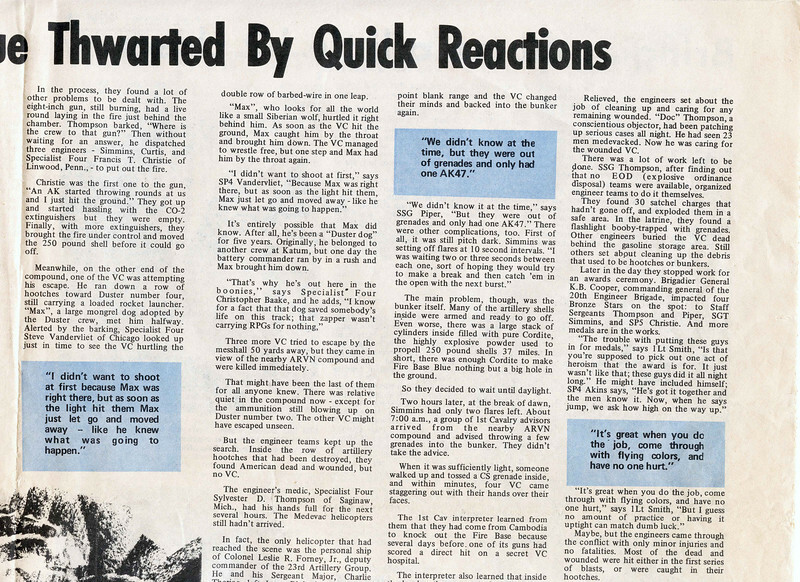 It was undoubtedly the most popular feature that ever ran in our paper! © 1971, MJ Roche. 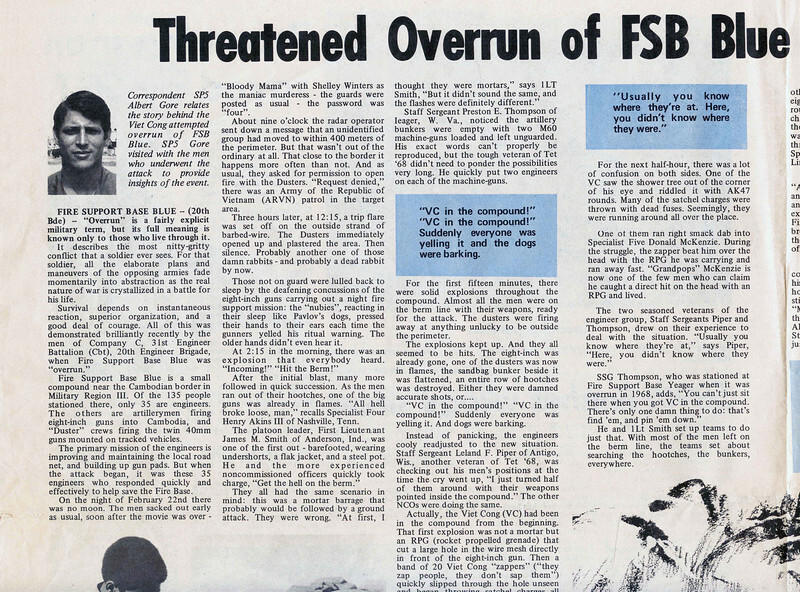 Inside this edition, SP5 Albert Gore, Jr., recounts the events of a battle at Fire Support Base Blue in an article for the "Castle Courier" Engineer Command Newspaper on April 5, 1971. 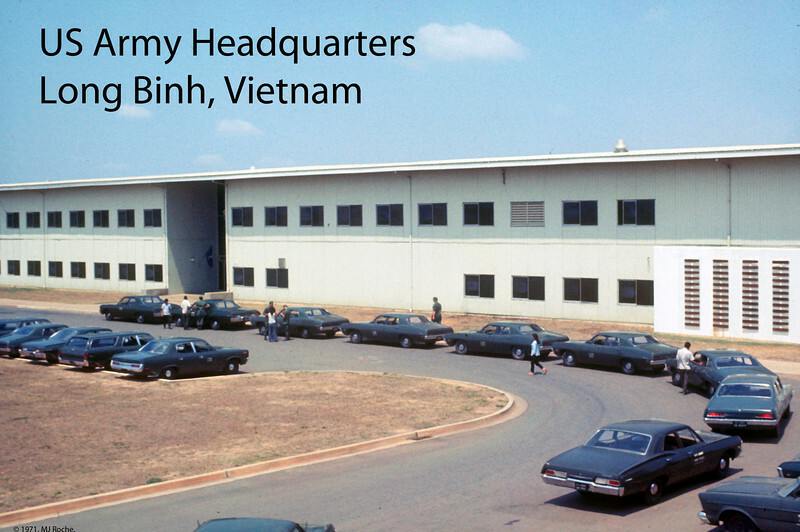 Edited at our newspaper offices , US Military Assistance Command Vietnam (MACV) near Ton San Nhut airfiled. Drawing by SP4 William Smith, photos by SP5 H. Alan Leo. © 1971, MJ Roche. 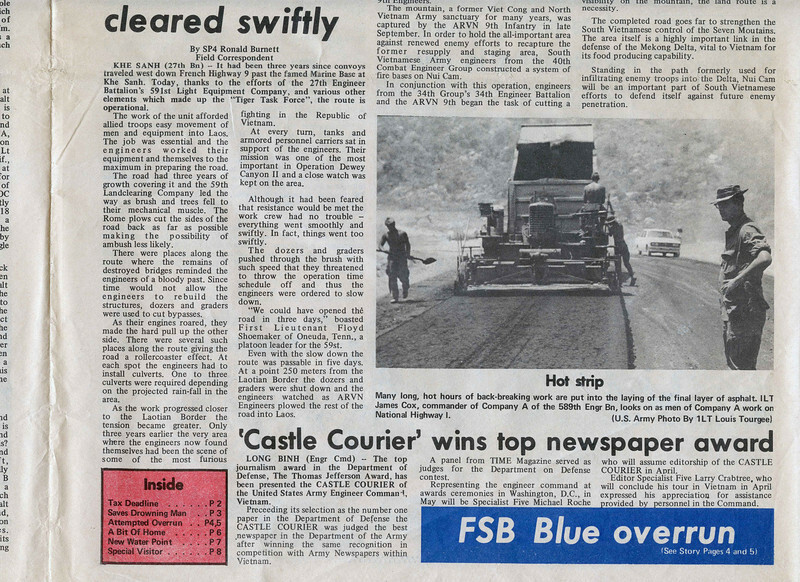 Front page of the April 5, 1971, edition of the "Castle Courier" newspaper announces the international award the newspaper received. © 1971, MJ Roche. 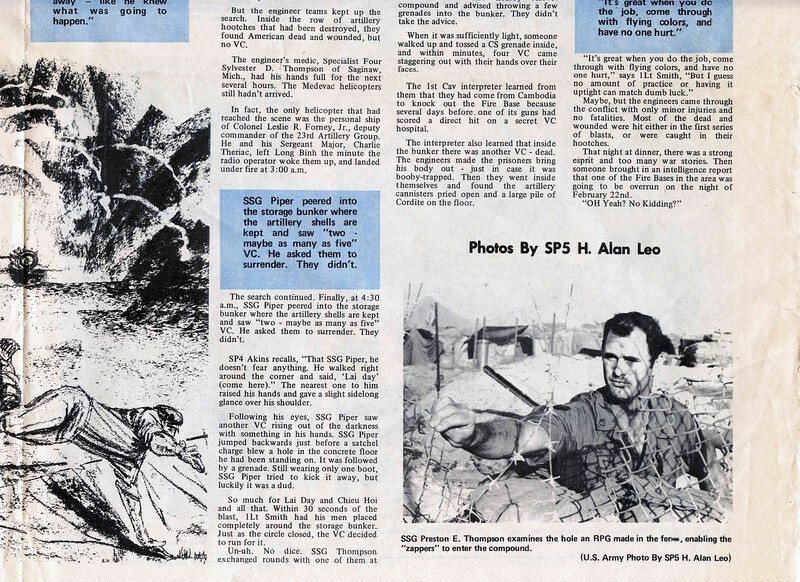 SP5 Albert Gore, Jr., recounts the events of a battle at Fire Support Base Blue in an article for the "Castle Courier" Engineer Command Newspaper on April 5, 1971. 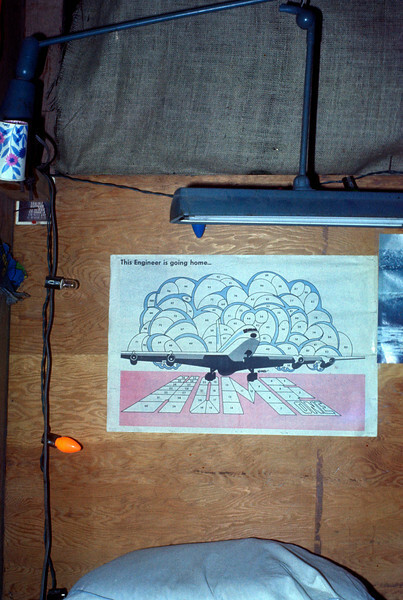 Edited at newspaper offices at US Military Assistance Command Vietnam near Long Binh. Drawing by SP4 William Smith, photos by SP5 H. Alan Leo. Gore would later serve as a Congressman, Senator and Vice President of the US under Bill Clinton. He was awarded the 2007 Nobel Peace Prize and won a 2007 Oscar for his documentary film addressing global warming ("An Inconvenient Truth"). © 1971, MJ Roche. 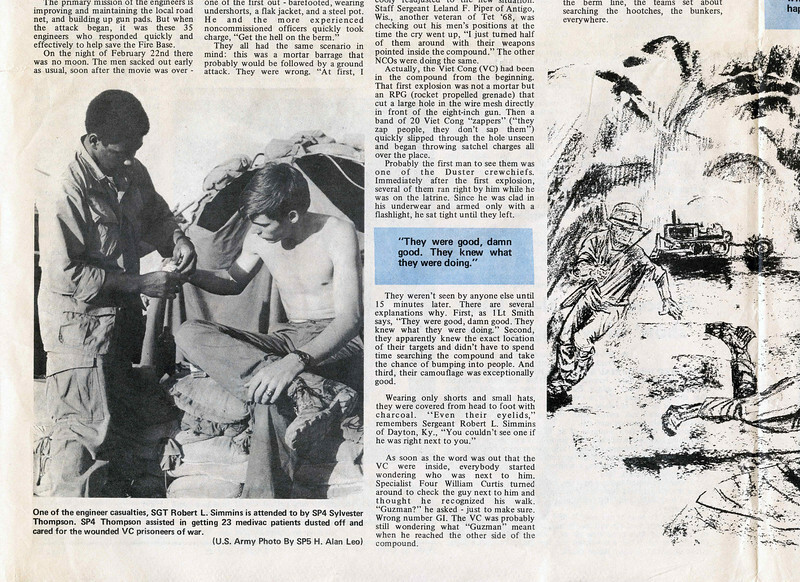 SP5 Albert Gore, Jr., recounts the events of a battle at Fire Support Base Blue in an article for the "Castle Courier" Engineer Command Newspaper on April 5, 1971. 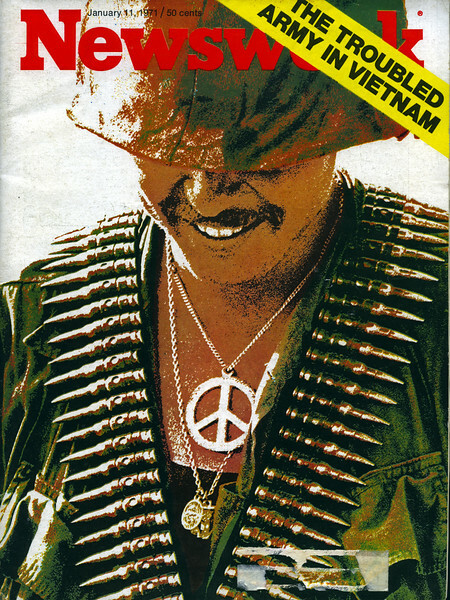 Edited at newspaper offices at US Military Assistance Command Vietnam near Long Binh. Drawing by SP4 William Smith, photos by SP5 H. Alan Leo. © 1971, MJ Roche. 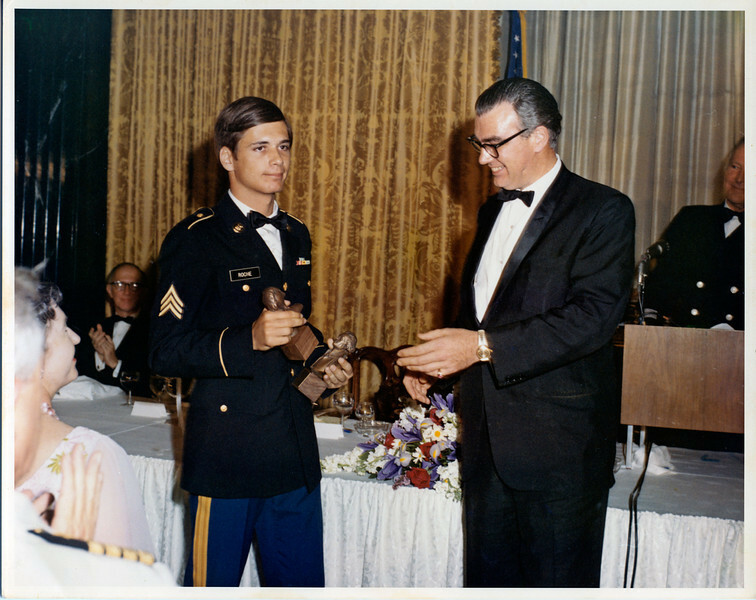 Henry Luce III, the elder son of the founder and editor in chief of Time Inc., presents the "Thomas Jefferson Award" for best military offset newspaper in the world. 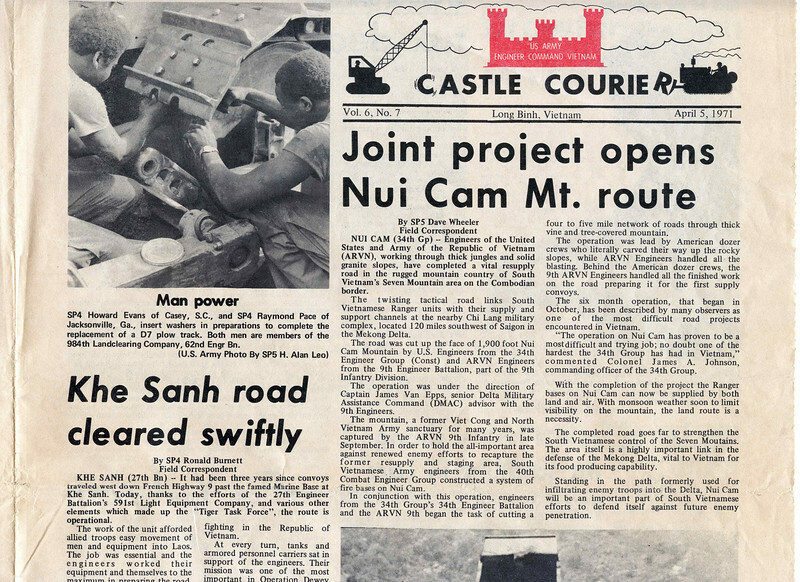 Accepting for the Engineer Command, Long Binh, RVN, is the editor of the"Castle Courier" newspaper, in May, 1971, at the State Department, Washington, D.C. Lief Ericson, actor and star of the "High Chaparral" TV series, served as emcee (right at podium). 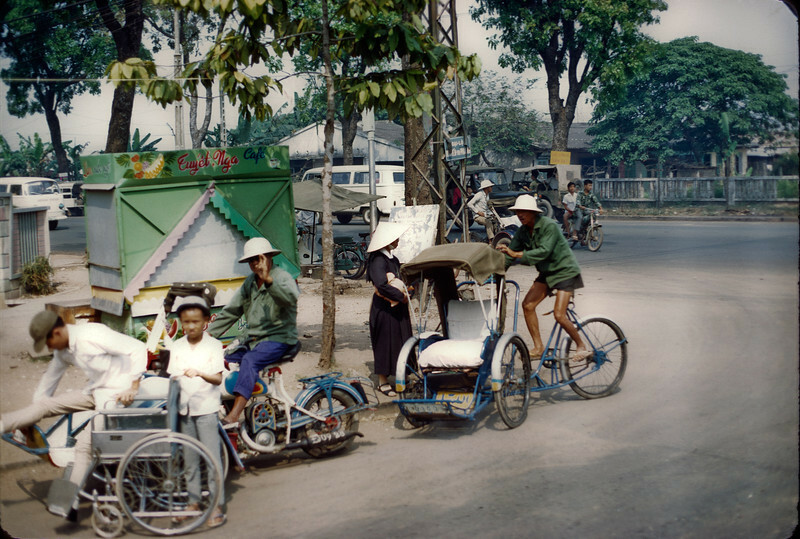 Cyclo drivers and Roman Catholic nun, Saigon streets, winter, 1971. © 1971, MJ Roche. At the nightly "circle of lawn chairs" between the hooches at Long Binh. Listening to tapes, barbequing a steak, drinking a beer, and watching aircraft overhead. A buddy from Maryland taught me how to enjoy a fine French Pinot Noir at this site. © 1971, MJ Roche. 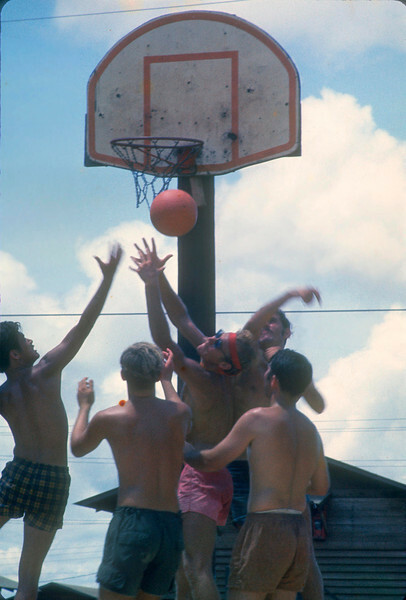 Hours of fierce basketball games helped us stay fit and pass the time. The Main Post Exchange (PX), retail store, in Vietnam. 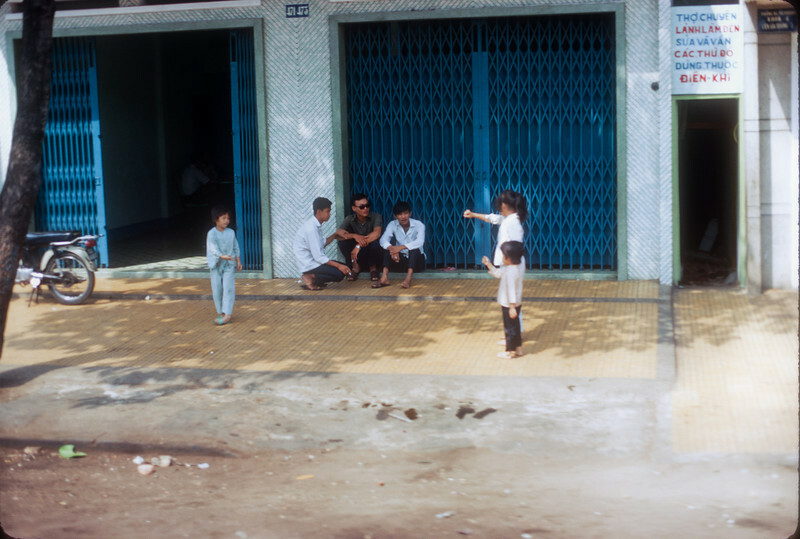 This shot was taken from the stairs of our hooch, directly across the street in Long Binh. Here GI's could purchase packaged foods, watches, Japanese stereo equipment and cameras. © 1971, MJ Roche. A group of REMF's head out to all-night guard duty on the wire at Long Binh. A REMF is a "Rear Echelon Military Folk". Other translations were more prevalent. © 1971, MJ Roche. 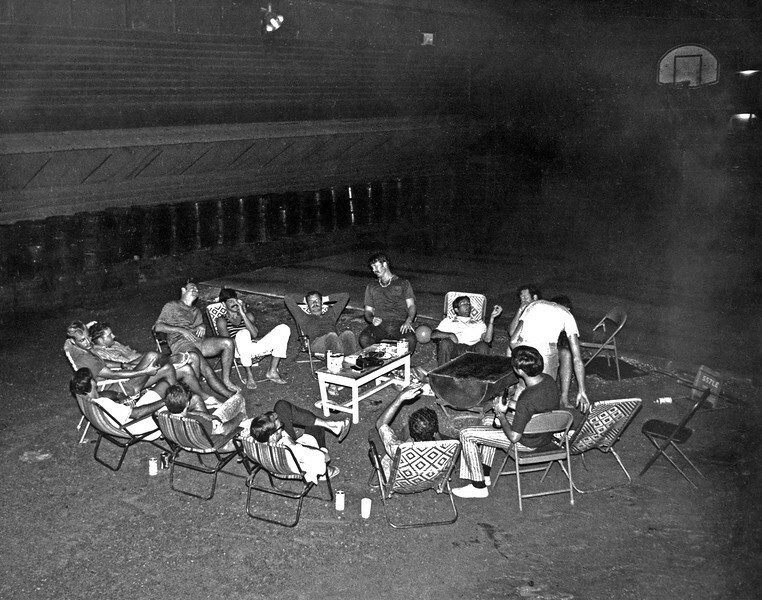 The nightly "Circle" at Long Binh between the hooches, next to the basketball pad. On this night I was given a lesson in how to drink fine wines properly. The tipped chair, far right, came from the 557th LE Engineer Bn., part of the 18th Engineer Brigade. A cassette tape played on the table provided the tunes. © 1971, MJ Roche. 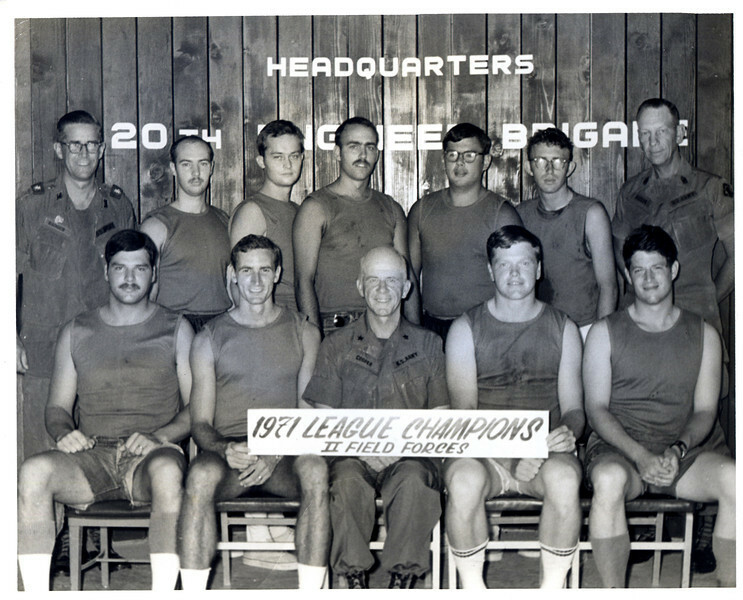 The winning team photo from a basketball league at Bien Hoa, Vietnam, March, 1971. Brigadier General Kenneth B. Cooper poses with NCOs and enlisted men including Albert Gore, Jr., (lower right). Photo by SP5 H. Alan Leo, US Army Engineers. Roadside scene near Di An. Note the "mini arm" extension at the center left on the cart. © 1971, MJ Roche. Entering Saigon. © 1971, MJ Roche. On patrol with an M-79 grenade launcher, April, 1971, outside of Long Binh. Photo by Martin Knanishu, US Army Engineer Command. LEFT BLANK INTENTIONALLY...I turned in or destroyed all of theses images! One of our duties as US Army photo journalists in Viet Nam was to assist in the verification of daily body counts for senior officers. This meant being choppered in to remote sites and photographing the killed-in-action to prove kills, in case body counts were questioned. I never retained any of these images. 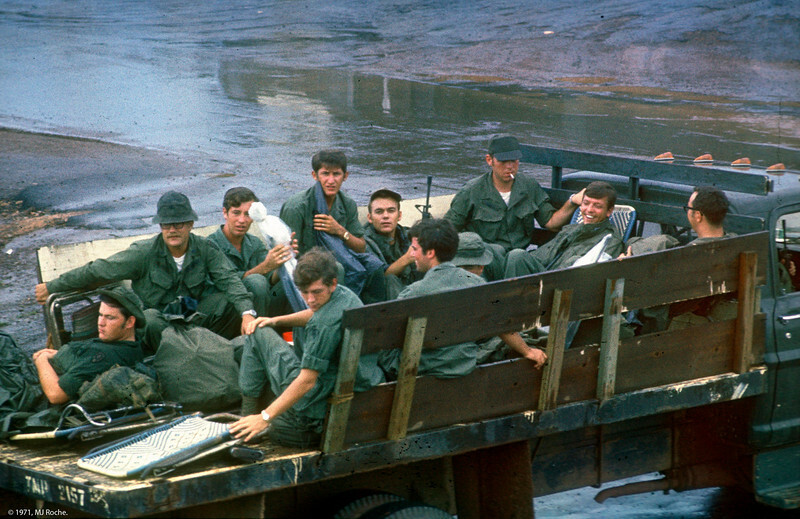 The news article that changed lives for REMFs in Vietnam. It detailed the ugly underbelly of the culture in the rear areas. 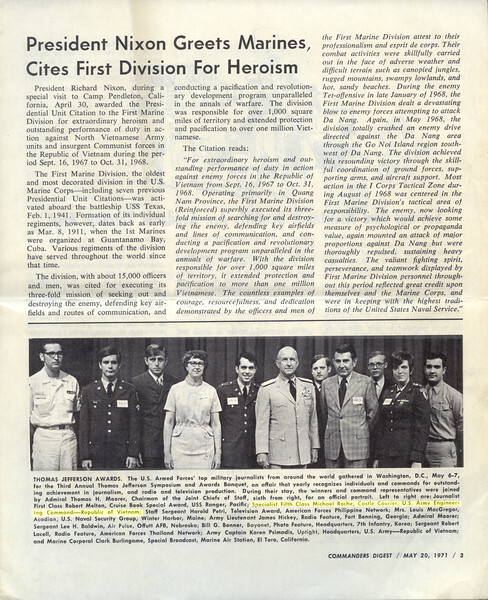 Some PIO (public information office or journalists) personnel whose units were named in the article were reassigned to other duties. Steam baths inside the wire were forced to close. 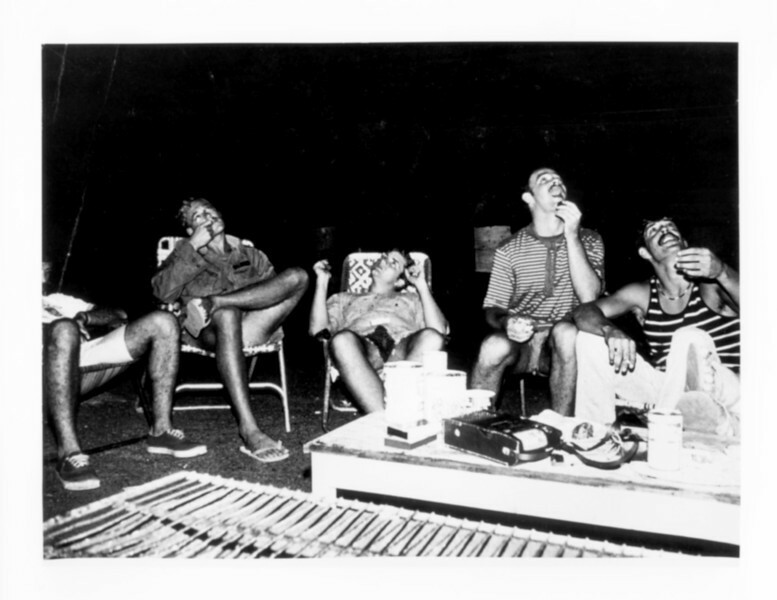 Drug testing prior to DEROS became routine. 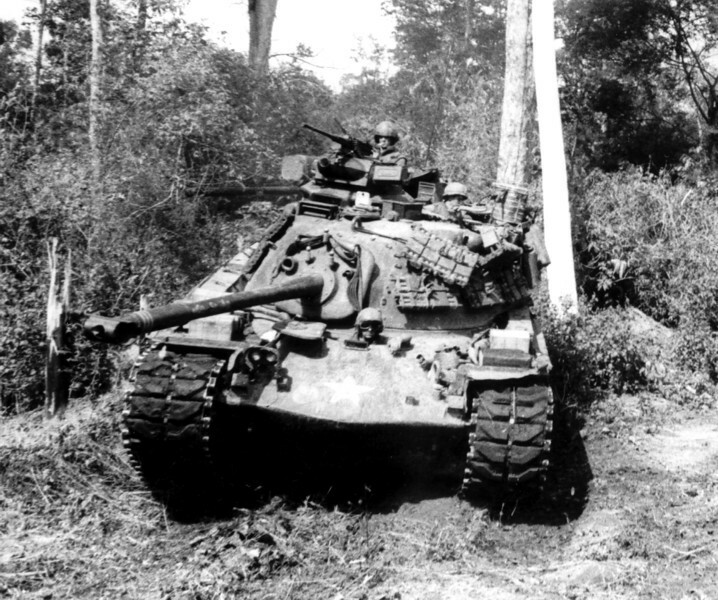 The American public's dislike of the war only intensified and, even though day-to-day life was less comfortable for GIs, it likely hastened the end of the conflict. 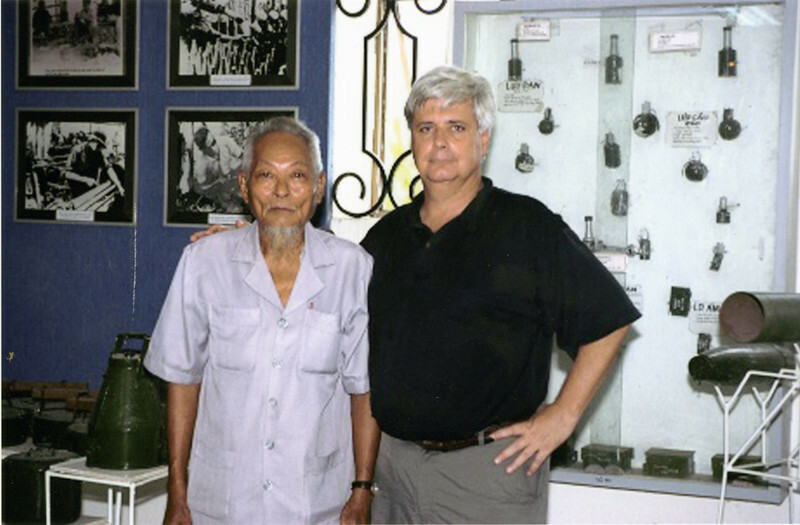 Former enemies meet in a Weapons Museum in Saigon in October, 2001. 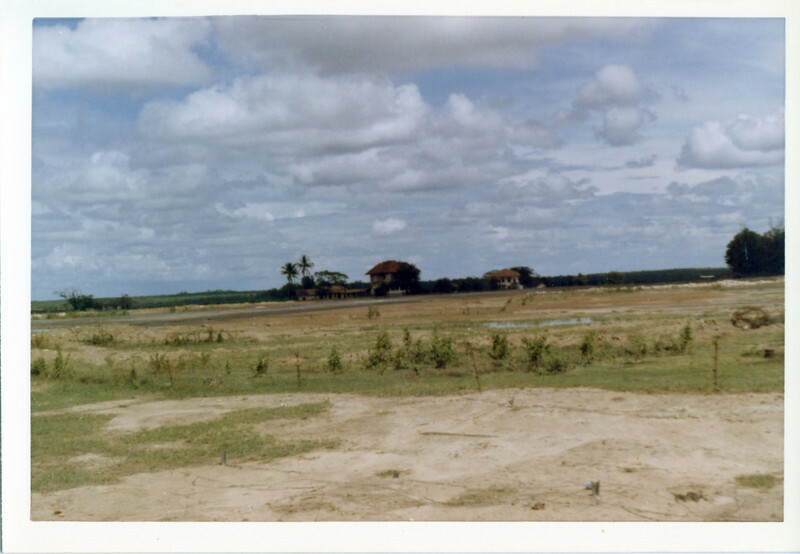 During a two-hour interview, which was guided by an interpreter from Anh Tours of Saigon, this former officer discussed how he was in the area when a rocket was fired into Cu Chi only days after I arrived at the 25th Infantry Division Headquarters. He was 92 years old in this photo. ROCHE IN WASHINGTON, D.C., MAY 1971. 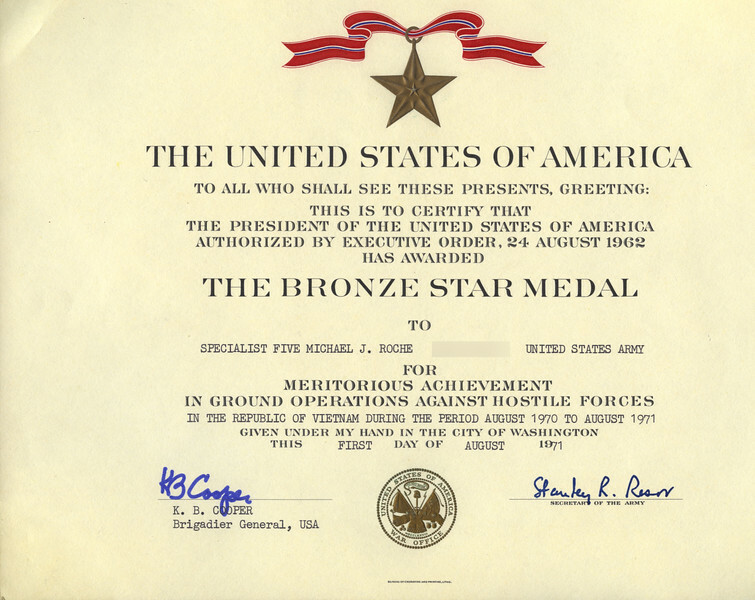 We met with the brass during the day, and I hung with war protesters in Georgetown at night. 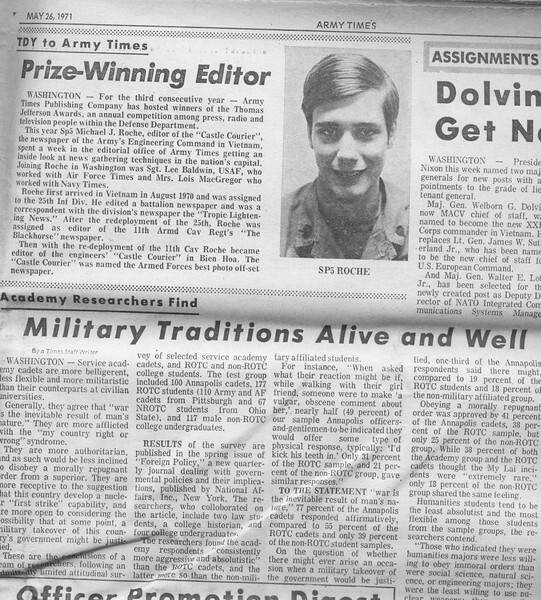 Army Times article. I work work at their news office and always had to leave early. It was boring, but better than sitting in Long Binh. From "Find A Grave" site. 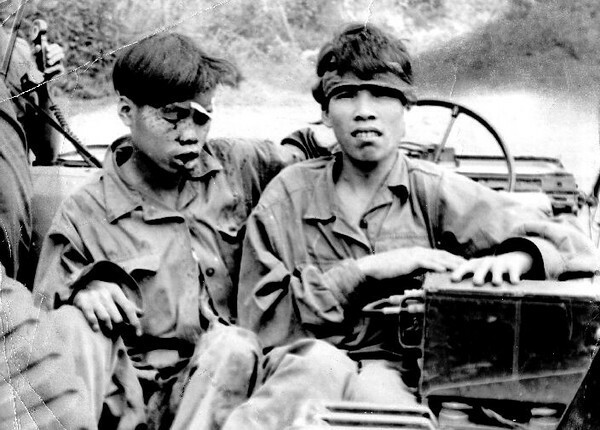 The shocking story of a brutal murder which happened at Cu Chi only hours after I was "boots down" in Nam.